The success of the BJP-led alliance in the 1999 Lok Sabha elections, resulting in the return of the Vajpayee government, is a setback for the democratic and secular forces in the country. The CPI(M) had set out the following main tasks to be achieved in the elections: Defeat the BJP alliance, strengthen the Left and democratic representation and aim for the formation of a secular government at the Centre. The failure to fulfill these aims confirms that the rightward shift in Indian politics continues. We have to properly analyse the election results, assess the present situation and the line of direction of our work. The BJP alliance has won 300 seats out of the 543. If the National Conference is included, the tally is 304. In this the BJP got 182 seats, the same number as last time. The NDA polled 40.8 per cent of the votes. Of this, the BJP polled 23.7 per cent which is 1.9 percentage point less than in 1998. The Congress party got only 113 seats, the lowest ever figure in its history. The Congress party polled 28.4 per cent which is an increase of 2.6 percentage points. The Left parties won 43 seats, with the CPI(M) getting 33, one more than last time. The strength of the Left has come down from 48 last time. The Samajwadi Party got 26 seats and the BSP 14 (both in UP), the RJD 7, the AIADMK 10 and the NCP 7 seats. The BJP alliance made major gains in Andhra Pradesh, Maharashtra, Bihar, Rajasthan and Haryana where it increased by 61 seats over its previous strength in these five states. It held on to its position in Madhya Pradesh and Gujarat. In Tamilnadu, in alliance with the DMK, it got a lead. It has improved its position in Orissa, Delhi and Himachal where it had a majority of the seats in 1998. In Assam though it won only to seats by adding one more seat, it has substantially increased its voting percentage and emerged as the second largest party displacing the AGP. It has also won both the seats in Goa for the first time. The states where the BJP alliance suffered reverses were Karnataka, Punjab and Uttar Pradesh. In Karnataka, the Congress got majority in both the Lok Sabha and assembly elections. In Punjab, the BJP-Akali alliance could win only three out of the 13 seats. The most serious setback for the BJP was in Uttar Pradesh where it won only 29 seats compared to 57 last time. In five states, Gujarat, Goa, Orissa, Himachal Pradesh and Delhi, the BJP alliance has polled more than 50 per cent of the total votes. The highest percentage of vote polled is in Orissa where the BJD-BJP alliance got 57.6 per cent of the vote. Assam is the other non-traditional BJP state where it has recorded a substantial increase polling 29.6 per cent. Though the Congress party increased its polling percentage by 2.6 per cent despite contesting around 20 seats less than in 1998, it has recorded a dismal low of 113 seats. This is mainly due to its rout in Andhra Pradesh where it lost 16 seats, Maharashtra where due to the split it lost 23 seats and conceded ground in the states where it had done well in the November 1998 assembly elections -- Rajasthan, Madhya Pradesh and Delhi. A significant feature of the Congress performance is that it has lost badly in the states where it is running state governments – Orissa, Madhya Pradesh, Rajasthan, Delhi and Goa. In the preliminary review made by the Central Committee in October 1999, five major reasons were cited for the success of the BJP alliance. A detailed assessment of the election results and the reports from the states show that these were the major factors contributing to the success of the BJP. Briefly put, they are: (a) the failure to set up an alternative government after the Vajpayee government collapsed in April 1999. The refusal to support a Congress-led alternative government by the Samajwadi Party and the subsequent shortsighted role of the Congress not to support any other alternative provided the handle for the BJP. The mood among sections of the people which had turned against the BJP due to its 13 months record in government was neutralised by the failure of the non-BJP parties to install a government at the Centre. This proved a big advantage to the BJP which could project itself as the only party/combination which can provide a coherent government at the Centre. (b) The second factor is the unanticipated conflict which erupted in the Kargil sector after the Pakistani intrusion. The military operations to evict the intruders went on for two months and the entire people’s attention was focussed on this. The patriotic feelings of the people were aroused. This event before the elections hampered the campaign to expose the Vajpayee government’s 13-month record with regard to its communal platform, its economic policies and attacks on democracy. The success of the Kargil operation was exploited by the BJP to enhance the image of the Prime Minister. The Kargil issue provided the BJP an opportunity to rally support from the urban middle classes and the youth. Though the impact was not uniform in the country, it did give the BJP an advantage in certain parts of the country. (c) The third major factor in favour of the BJP was its wide-ranging alliance. Not only was the alliance forged in 1998 kept intact but it was widened. The only difference from 1998 being the DMK replaced the AIADMK in Tamilnadu. The BJP alliance which had many regional parties like the TDP, DMK, the BJD, the Lok Shakti, Trinamul Congress and the Samata was further strengthened by the addition of the JD(U). Not only did these parties bring in additional support through their own mass base but it helped the BJP also in another way. The fact that many regional parties of a secular character were allied with it, blunted to a large extent the exposure of its communal character and its anti-secular policies. The sidetracking of all other issues due to the Kargil war for a long period and the cover provided by the regional parties for the BJP, both helped the BJP. The first by preventing the exposure of its harmful record in economic policies and the second by providing a cover to the communal character of the BJP. (d) The fourth factor is the role of the Congress. In the run up to the elections, the Congress split with Sharad Pawar and two other CWC members forming the Nationalist Congress Party, thus from the outset itself the Congress presented the picture of a house divided. Further the Congress advocated the same economic policies of liberalisation as seen in its manifesto. In fact it promised further initiatives in this direction. Flying in the face of the ground realities, the Congress party campaigned that it alone can provide a stable government through single party rule. Such a claim having no basis in reality was not taken seriously by the people. Given its weakened organisational and ideological state, and its refusal to seek allies, it was in no position to counter the powerful combine of the BJP. An analysis of the trends in the elections show that for large sections of the people, the Congress continues to be identified with its past record of discredited policies, corruption and misrule. By refusing to put forward any new socio-economic platform in the interests of the people, the Congress allowed the BJP to make it a contest between Atal Behari Vajpayee and Sonia Gandhi. The reports show that the BJP’s campaign against Sonia Gandhi’s foreign origin and her background of lack of public experience had an adverse impact on sections of the middle classes both in the urban and rural areas. It was thus able to benefit from the perception that it alone can provide a stable government. (e) The fifth factor is the absence of a viable third force at the national level. This particularly affected the Left and democratic forces. The falling apart of the old United Front and the differences which arose on the question of adopting a line of equidistance between the BJP and the Congress precluded any possibility of a national level alliance before the elections. This handicapped the party and the Left in various ways. One effect was that in the absence of a viable third force in many states, the traditional anti-Congress votes went to the BJP-led alliance. The slogan of a secular government at the centre could not help us in the three Left bases of West Bengal, Kerala and Tripura to appeal to wider sections of people. In the prevailing situation it was not possible to project an alternative government except in vague terms. Apart from these five factors, the four-month caretaker government period was fully utilised by the BJP to advance their partisan interests. The notorious telecom scam and the sugar scam related to the import of sugar from Pakistan all indicate the way resources were raised for the elections. The big business controlled media played a major role in creating an atmosphere in favour of the BJP. A notable feature of these elections was the massive use of money power by the BJP and its allies on a scale not seen so far. Some important features of the results have to be noted. ((i) The strength of the BJP has not increased in terms of seats despite all the advantages and resources it had. It has been able only to retain the number of seats it had in 1998. (ii) The Congress party has fared badly and not been able to make any recovery despite being the major opposition party. Its past record and present policies continue to be discredited and opposed by large sections of the people. (iii) Despite the disruption of the United Front in 1998-99 and the disarray among the forces of the third alternative, the parties which are not part of the BJP alliance and who do not subscribe to the Congress platform continue to have a significant presence and this is reflected in parliament. Such parties have around a hundred seats in the Lok Sabha. (iv) The claim that a two party system will emerge from these elections has been debunked. The results also confirm that no single party can form a government on its own and coalitions have become the norm for the near future. The political resolution of the 16th Congress had pointed out that the emergence of the BJP as a major bourgeois-landlord party "suits the interests of imperialism and sections of the ruling classes". It had stated "the erosion of the Congress had resulted in a shift in class terms of considerable sections of the big bourgeois-landlords in favour of the BJP". The present elections have confirmed this trend. Leaders of the associations of big business like the CII, FICCI and ASSOCHAM publicly endorsed the platform of the BJP as represented in its manifesto. The bulk of the big business supported the BJP openly and financed it. US imperialism was keen to see the return of the Vajpayee regime with which it had developed a close working relationship. Even during the caretaker period of the Vajpayee government in the run up to the elections, the US administration continued its agenda of talks with the Vajpayee government on the CTBT, WTO and Kashmir, anticipating the return of the government. The big business already controls the print media. The electronic media with privatisation has also come under the influence of big business. The Prasar Bharati was already being used by the caretaker government. Thus the entire media including significant sections of the regional media rallied in support of the BJP and projected issues in such a manner as to favour the BJP alliance. Another aspect of this campaign was the use of opinion polls and exit polls to influence public opinion by projecting a big victory for the BJP. While noting the fact that the BJP could not cross the 182 seats it won in 1998 and that its percentage of votes is less than last time, it would be wrong to conclude that its mass base and influence is shrinking. Since the 1989 elections it has been steadily increasing its strength. In exactly a decade the BJP has been able to grow and become first the major opposition party in parliament (in 1991) and then become the largest single party in the Lok Sabha in 1996. In three consequent elections in 1996, 1998 and 1999, the BJP has emerged as the largest single party in the Lok Sabha. While it is true that the BJP cannot get a majority on its own and has been successful by forging a broad alliance, the strength of the BJP should not be underestimated. Here certain points must be noted. (i) The BJP percentage has decreased because it has fought nearly 50 seats less than in 1998. (ii) Its overall tally could not increase because of its bad performance in U.P where alone it lost 28 seats. (iii) It has been able to expand in many other states like Assam, Orissa, Goa etc. It continues to attract support from new sections of the people and in new areas. The BJP has created a large constituency among the urban middle classes. This applies both to the big cities and to the small towns. This trend of support from among these sections had been noted in the 1996 and 1998 elections too. This support for the BJP continues, though there are some exceptions. The middle classes are not the same strata as in the 1960s and 70s. A substantial part of the middle class have benefited from liberalisation. Their numbers have proliferated with the expansion of the services sector. As the 16th Congress political resolution noted: "illusions are fostered among them about the benefits of liberalisation. The communal forces are also able to exert and appeal on the urban middle class. The bourgeois media targets these sections to foster mindless consumerism and anti-democratic values." With the decline of the Congress and the exhaustion of the old Nehruvian framework, new sections among the middle class look to Hindutva as an alternative ideology. There are atleast 50 to 60 million people belonging to this category who are setting the pace of public opinion. The BJP is drawing sustenance from these sections in the absence of a powerful democratic movement among them. The important role played by this strata in the BJP’s success can be seen from the fact that out of a total of 19 parliamentary constituencies in the four metropolitan cities, 18 have been won by the BJP and its allies. Another aspect of the BJP’s performance is the support it has garnered among substantial sections of the youth. Sections of educated youth both in urban and rural areas have been attracted to the BJP. This is a disturbing feature as with the decline of the Congress, instead of the Left and democratic forces, sections of the youth are being attracted to a rightwing communal party. The 1996 election review had pointed out that the BJP’s growing influence is based on the penetration of the Hindutva ideology through the organisational network run by the various outfits of the RSS. Educational institutions, adivasi organisations, and caste organisations are all being used by the RSS outfits. The Vanavasi Kalyan Ashram is working in the tribal areas systematically which is also motivated by the necessity to counter the influence of Christian missionaries. It is significant that the BJP has won the bulk of the ST seats in Orissa, Bihar, MP and Gujarat. The Left parties have won 43 seats in the Lok Sabha (in 1998 it had got 48 seats). Of this the CPI(M) has won 33 (one more than in 1998), the CPI’s strength has come down to four from 9 they had in 1998, the RSP has 3 seats and the Forward Bloc 2. One seat has been won by the LDF partner in Kerala, the Kerala Congress(J). Apart from this, the PWP has won 1 seat in Maharashtra and the CPI(ML) 1 seat from Assam. Of the 33 seats won by the Party, 21 are from West Bengal, 8 from Kerala, 2 from Tripura and 1 each from Tamilnadu and Bihar. The Party lost three seats in West Bengal compared to its 1998 tally. It got two more seats in Kerala – from 6 to 8 and retained both seats in Tripura with bigger margins. In Tamilnadu, the Party won the Madurai seat and in Bihar, the Bhagalpur seat. West Bengal : The Left Front has won 29 seats out of the total of 42 which is 4 less than last time. Of this, the CPI(M) lost 3 and the RSP 1. The Left Front secured more or less the same percentage of votes as in the 1998 elections. It has now secured 46.7 per cent as compared to 46.8 percent in 1998. The BJP-Trinamul Congress increased their vote by 2.6 per cent while the Congress vote declined by 2.9 per cent. The elections were fought in the state in the face of the unfavourable national situation where the failure to form an alternative government and the absence of a third force was utilised by the TMC-BJP combination to launch a big offensive. The mainstream media conducted an anti Left Front campaign as usual. 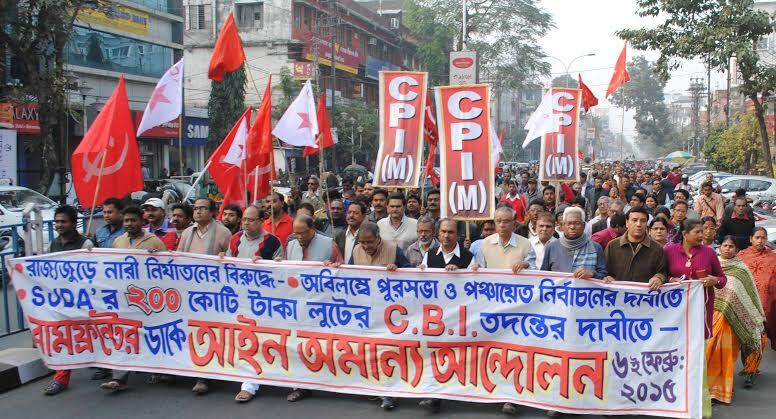 But what was notable this time was the viciousness of the systematic campaign launched by the major newspapers against the CPI(M) and the projection of Mamata Banerjee. A new feature was the large-scale terror tactics and violence indulged in by the Trinamul-BJP combine in South 24 Parganas, Murshidabad and parts of Midnapore, Hooghly and Bankura. This indicates a new anti-Communist offensive. The serious flood which affected the 15 districts in the middle of the elections affected the people badly. The Party was fully engaged in rescue and relief work. However the problems created by the floods also affected the people’s mood and in some places hampered their voting. Overcoming all these, the Party organised an intensive campaign to reach out to all sections of the people. The overwhelming majority of the rural poor, scheduled castes and tribals supported us. In the industrial areas and urban centres our results were comparatively better than in 1998. Out of the 294 assembly segments the Left Front has won in 189 assembly segments while the TMC-BJP combine has won in 83. The Congress got leads in 20 Assembly segments. The review made by the West Bengal state committee has noted that in the rural belt in villages and towns dominated by the middle class our influence has declined. Similarly the youth belonging to the middle classes have been turned away from us. An important fact is that sections of the refugees from Bangladesh have rallied to the BJP-TMC combine . This is especially true of sections of the new generation among the refugee families and the post 1971 influx of refugees who have come under BJP influence. After 23 years of Left Front government there are positive and negative aspects. The growth of unemployment, inadequate facilities for education, health, roads etc have had a negative impact. Where we have failed to improve the functioning of the panchayats and local bodies and remove the malfunctioning and wrong practices, sections of people have been alienated including those belonging to the basic classes. At the organisational level, the reports about inactivity of a small section of Party members and lack of unity in the party in certain units are problems which need to be tackled. The rectification campaign within the party and the drive to improve our functioning in the elected bodies at all levels including the performance of the government, must engage the attention of the Party on a priority basis. Kerala : The elections are always closely contested between the LDF and the UDF in Kerala. The results in 1999 were the same as last time in terms of seats – 9 for the LDF and 11 for the UDF. The LDF polled 43.4 per cent of the vote which is 0.9 per cent less than last time. The UDF polled 46.6 per cent which is 1 per cent more than last time. The difference between the LDF and the UDF is 3.3 per cent. The Party conducted a highly organised and intensive campaign against the UDF. The Congress in its desperation came to a secret understanding with the BJP in two seats – Mukundapuram and Trivandrum to help each other. Overall the record of the Party in defence of secularism and the election campaign had its impact on the minorities and it was expected that there would be a substantial swing in favour of the LDF. However, unlike in 1998, when all the Muslim organisations like the INL, the PDP and the Jamaat-e-Islami had contested independently, this time they supported the IUML and the UDF candidates. This consolidated the Muslim vote in many areas behind the UDF. Similarly the Christian votes in many areas got consolidated behind the UDF. The party was able to reach out to people outside our sphere of influence through the organisation of tens of thousands of family meetings, a new feature in the campaign. Traditionally in Kerala there is a divergence in the voting pattern for the assembly and parliament elections. Normally the UDF gets a bigger vote for the parliament election, even when simultaneous elections to the assembly are held are held. Last time too the UDF got a majority in 81 out of 140 assembly segments. However, this time, it was able to increase it to 91 while the LDF won in 49 segments. This and the fact that there was a percentage wise decrease for the LDF in 12 constituencies must be treated seriously. Even though the LDF government has undertaken many worthwhile policies like the people’s planning process and the maintenance of the public distribution system and other benefits for the people, we must examine how its implementation has had its impact on the people. A larger question is how we can advance the Party’s influence among the minorities and win over sections who are still tied to the UDF parties. Tripura: In Tripura we have won both the seats with bigger margins polling 54.8 percent of the vote in Tripura East (ST) and 57.5 per cent in Tripura West. A new feature of the elections was the formation of the Trinamul Congress after the split in the Congress on eve of the elections. The Trinamul Congress had an alliance with the BJP and the TUJS. The TUJS broke its longstanding alliance with the Congress. 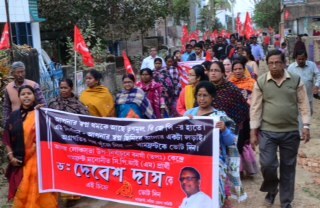 The Party and the Left Front had to counter the BJP-Trinamul-TUJS combine as its main opponent and also overcome the difficult situation created by the continuing extremist violence which has disrupted life in many tribal areas. It is creditable that the Party has been able to achieve success in such difficult conditions. It is the determined fight waged by the Party units of Kerala, West Bengal and Tripura which has enabled the Party to withstand the combined onslaught off the BJP alliance and the Congress. In two of these states, West Bengal and Tripura, the Trinamul-BJP alliance has emerged as the main opponent of the Left. In Kerala, the UDF and the BJP acted in concert to try and isolate the LDF. It is creditable that given the overall national situation we have been able to beat back these attacks and maintain the position of the Left in these three states. In the other states except for the victory in Madurai and Bhagalpur, the performance of the Party has been disappointing. In the second seat in Tamilnadu (North Chennai) the Party came second polling 3.3 lakh votes. In Purnea, the second seat in Bihar, we got only 29,000 votes. The results in other seats are disappointing, not because we expected to win any of the seats, but because we could not increase our voting strength. In Andhra Pradesh some erosion of support has taken place. We contested 7 Lok Sabha seats. Though we did not expect to win any of them, what is of concern is that there has been an erosion in the voting base of the Party. Compared to the 2.8 per cent voted polled in 1998 contesting 3 seats in alliance with the TDP, the Party has polled only 1.4 per cent contesting 7 seats. In the assembly elections, the party has polled 1.7 per cent contesting 48 seats. Our performance in Telangana area was better while we lost ground in the coastal districts. We were able to win two seats while the CPI failed to get any. For 14 years the Party had an alliance with the TDP and last year after we broke with the TDP we tried to assert our independent position and campaigned against the TDP government’s policies. Yet, after the break it is clear that we have not gained any new sections from this prolonged alliance with the TDP, rather some of our own votes have gone to the TDP. In Assam, the Party contested two seats. It polled 1.41 lakhs in Barpeta and in Karimganj 34,250 votes. In Maharashtra we contested three seats. In Dahanu we polled 89,459. Here our vote has been declining in the last three elections. In the second Malegaon we got 69,142 votes and in Nandurbar we polled 13,625 votes. In Punjab, in the one seat contested, Sangrur, we polled 1.9 lakh votes. In Rajasthan, in the Sikar seat the Party got 80,000 votes. In Madhya Pradesh we contested a new tribal seat Sarguja where we polled 11, 985 votes. In Uttar Pradesh we contested two seats without any alliance – Chandauli and Akbarpur where we fared poorly getting 8613 and 5271 votes respectively. In the Kashmir Valley, the election was marked by large-scale rigging and misuse of the official machinery. Such tactics have further alienated the people. Only in Anantnag seat, because of the presence of a strong opposition which maintained links with the people, such efforts were thwarted to an extent. In this seat despite the threats of extremist violence and rigging, our candidate polled over 16,000 votes getting 15 per cent of the vote. In Orissa in the two seats we contested in Puri and Sundargarh we got around 13,000 votes in each seat. In Haryana, the Party contested Bhiwani seat and got 10,511 votes. "In projecting the independent political line of the Party among the people, in taking ideological and class positions distinct from the bourgeois parties, the Party is lagging behind. When such wider alliances and joint fronts with other political parties are forged and this independent political ideological stand is absent or lagging, the Party’s growth gets limited. It is difficult for the people to see the distinct identity of the Party. "Secondly, the call for independent activities of the Party is often ritualistically observed in a formal manner without sufficient initiative taken at the grassroots level to take up the class and mass issues and launch struggles and movements. The capacity to take up independently issues by the party and to wage militant struggles has been giving way to general campaigns and reliance on electoral tactics not very dissimilar to bourgeois parties. In such a situation, the methods utilised by the bourgeois allies such as caste mobilisation, populist slogans devoid of a class content and tendency to tail behind the slogans of the dominant bourgeois partners is becoming increasingly manifest. "In such a situation, neither the Party’s independent strength nor its electoral influence grows and the tendency to tail behind the bourgeois parties ends up in strengthening them and not the Party and the Left forces." This self-critical appraisal still remains valid and we have not been able to overcome the various weaknesses. The 16th Party Congress worked out the political-tactical line wherein we targetted the BJP as the main danger which has to be fought. We did not adhere to the line of equidistance between the BJP and the Congress given the changed political situation. It is based on this that the electoral tactics were adopted. Equidistance would have meant failure to appreciate the new political situation and diluting the main direction of attack against the BJP and the communal forces. The withdrawal of support by the AIADMK led to the fall of the Vajpayee government. Our intervention at that time and the stand we took during the Vote of Confidence was in line with the direction given by the Party Congress to work for the defeat of the BJP government. The failure to put in an alternate government was a setback but it does not detract from the line that we pursued to defeat the BJP. The May 1999 CC meeting worked out the electoral line. It stated: "In the coming general elections, our main task is to defeat the BJP and its allies. We have to work to strengthen the Party and the Left and rally all the secular and democratic parties and forces who are opposed to the Congress policies too. While directing the main fire against the BJP, we should also oppose the Congress Party's politics and policies in such a manner as to project the need for a third alternative. The Left will have to advocate the alternative policies which can attract all sections of the working people and the ordinary citizens." While giving priority to the defeat of the BJP-led alliance, the line called for the opposing the Congress party's politics and policies and to project the need for a third alternative. The Party had correctly assessed that there is no viable third force available in these elections and that in some states the fight would be between the BJP and the Congress. In such states, it was decided that: "we should fight only a few seats where we can effectively register the Party's presence and in the state as a whole campaign to defeat the BJP". In two states -- Tamilnadu and Andhra Pradesh -- we had to deal with the specific situation where our erstwhile allies, the TDP and the DMK, had deserted to the BJP camp. In the case of Bihar, we had already decided that notwithstanding our opposition to the RJD state government, we should cooperate with the RJD at the national level in the fight against communalism. By and large the line was implemented keeping in mind the different situation prevailing in the states. However, soon after the May meeting itself, an impression was created by some statements of the Party leadership that our fight against the Congress is confined to the three states of West Bengal, Kerala and Tripura. This implied that we were cooperating with the Congress elsewhere which was not true. We were fighting both the Congress and BJP in many places as in Assam, Andhra, Karnataka, UP etc. When the BJP and later Sharad Pawar raised the issue that Sonia Gandhi cannot be prime minister as she is a citizen of foreign origin, we took the correct position that no citizen can be barred from the rights accorded in the Constitution by origin of birth. But repeated remarks in the press and articles that Sonia Gandhi is eligible to be P.M. led people to believe that we were endorsing her actual candidature for prime ministership. That while recognising the right of any citizen including Sonia to be PM, we had our opposition to the Congress and its leadership, was not at all brought out. Some remarks of extending support to a Congress-led government, after the elections, also reinforced the impression that we were adopting a pro-Congress line. It must be self-critically noted that such statements created the impression that we were keen for cooperation with the Congress and was not serious about rebuilding a third alternative after the election. Such an impression among the Left sympathisers and the media projections created difficulties according to the reports of many state committees. There was an overestimation of the strength of the Congress in the assessment made by the Party Centre in the course of the election campaign. Questions have arisen about the way we implemented the line in Tamilnadu. The Central Committee had decided that we should have a seat adjustment with the AIADMK and not have a front with the AIADMK and its partners like the Congress and the INL. However, in practice, what developed was a front with joint campaign with all the parties. The approach went beyond the line we worked out vis-a-vis the Congress. In Punjab, in the Sangrur seat which we contested, the Congress did not put up a candidate. Here also joint campaigning with the Congress took place. Both these instances strengthened the impression of our having an alliance with the Congress. Another point of self-criticism is that though we stated that we should popularise alternative policies, we hardly reflected this in our campaign. Our alternative policies are different and oppose to both the BJP and the Congress and other bourgeois parties. This aspect was hardly projected. Anti-BJP propaganda alone does not constitute the comprehensive alternative platform of the Party. This amounts to a failure to project the independent line of the Party. This time, we could field only 5 women candidates which is 2 less than last time. Both in West Bengal and Kerala we put up one less woman candidate. In Andhra Pradesh, though we contested 7 seats, we could not put up a woman candidate. This time, since elections were held after 18 months, it was difficult to have advance planning for candidates or change those already there. Yet, we must ensure that atleast the stronger states field more women candidates. In these elections, many bourgeois parties put up more women candidates than us proportionate to the total number they contested. The overall review of the election work put in by the Party in various states shows that outside the three strong states of West Bengal, Kerala and Tripura, the activities of the Party and the mass organisations are not expanding, nor translated into political influence of the Party even after a long period of work. The major organisational weaknesses pinpointed in the Organisational Report of the Party in the 16th Congress and in the CC document on Rectification are the main reasons for this failure. If planned and time bound steps are not taken to rectify the situation, the Party's advance will not only be hampered but in the prevailing situation, the existing mass base of the Party can be eroded by the hostile forces. The reports from the states indicate certain negative features. In some states, there are reports of a few Party members, including some local leaders, working against the Party line and working for the candidates of other parties. This is not confined to one state. Such reports have come from Andhra Pradesh, Assam, Maharashtra and even West Bengal. Earlier, there used to be reports of inactivity by Party members. This time however, there are reports of Party members going against the Party's line even though they may be few in number. It is necessary that such cases are immediately dealt with as such persons cannot be of any use to the Party. In selection of seats due care was not taken to assess our actual position in some cases which led to wrong choice of seats. In assessing our prospects and the results also, Party committees rely on our periphery rather than the general masses. Even in Kerala after repeated assessments, the reports provided by the committees was that we would win 17 out of the 20 seats. This shows either that subjective considerations prevail or, we do not have adequate links with the masses. The Andhra Pradesh review notes "Selective consideration of realities according to our subjective inclinations, lack of comprehensive approach, inability to gather concrete information, rejection of information received from non-Party sources are some of the shortcomings which hampered the process of proper assessment." In future we should ensure that assessments are made after getting a proper feedback from different sections of the people, particularly non-Party sources. The need for raising the ideological and political level of all Party members and providing intensive ideological education has assumed urgency given the growth of reactionary ideologies and the growing aggressiveness of anti-Left forces. Faced with deliberate attempts to increase religiosity and caste identities, purveying of consumerist and egoistic values through the media and large-scale anti-Communist propaganda, we must be able first of all to equip our Party members, to meet this offensive. Both the Kerala and West Bengal review reports underline the role played by the Party newspapers in informing the people about the Party’s positions and countering the anti-Left propaganda. 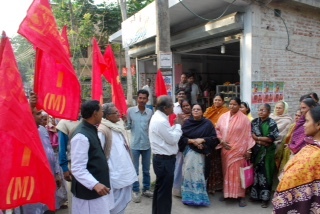 Deshabhimani and Ganashakti saw an increase in their circulation through special drive for the campaign period. The experience of the other dailies is also positive. However, at the central level, the circulation of People’s Democracy and Lok Lehar actually declined in this period. This is a matter of concern and should be looked into immediately. As pointed out in the 16th Party Congress resolution, it is necessary for the Party to conduct intense ideological work amongst the middle classes to draw them into the democratic movement. Special efforts must be made by Party units working among middle class employees to step up ideological work. Alongwith this, the issues affecting the middle classes and their perceptions of political issues must be given due attention in our Party's propaganda. In view of the inroads made by the BJP in certain areas among the youth, we will have to pay special attention to the youth and students and for developing their movements and activities in such a manner as to counter to expose the Hindutva forces and counter the influence. The Party Congress has drawn attention to the need to counter the RSS organisation's work among the adivasis and other sections of people. We have to take up this work seriously as per the direction given in the Party Congress. In view of the inability to register advance in most of the states, among new sections of the people, or, to maintain the existing spheres of influence, it is essential that the Central Committee take steps to implement the organisational directives of the Party Congress on a priority basis. For this purpose, the next Central Committee meeting of the Party should discuss the immediate tasks to be taken up for Party organisation on the basis of a report submitted by the Polit Bureau. Due to differences in approach between us and the Forward Bloc and RSP on the question of equidistance between the BJP and the Congress it was not possible for us to have any joint manifesto of the Left parties as we did in 1998. Our understanding with these two parties were there at the states level in West Bengal, Kerala and Tripura where they are part of the Left-led fronts. 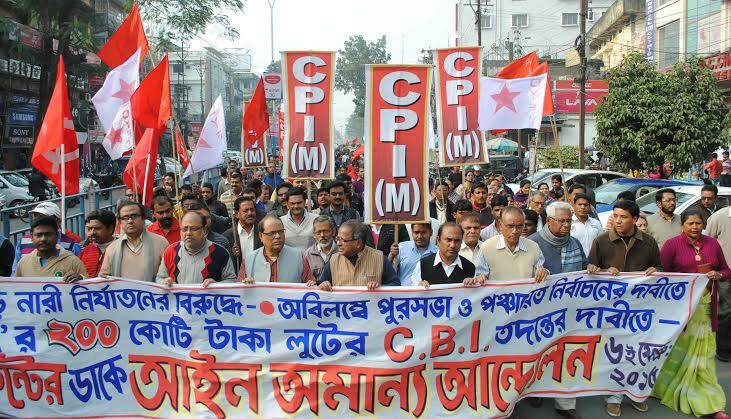 The CPI(M) and the CPI had a common understanding about the tactics to be pursued in the elections. By and large the two parties worked together. However, in some places strains developed. In Andhra Pradesh, the state unit of the CPI advocated going with the Congress after the TDP and the BJP came together. But our Party did not agree and it was only after prolonged talks and the failure of the CPI to come to an understanding with the Congress that we were able to work out an understanding to work together in the Lok Sabha and the assembly elections. In Bihar, the adjustment could not be reached between the RJD and the CPI. The CPI was unhappy about being allotted only three seats and decided to fight nine seats. As we had arrived at an understanding with the RJD we decided to support the CPI only in the first three seats which were given to them as part of the overall understanding. The CPI in Bihar not only worked against the RJD in many seats but did not support us in Bhagalpur despite our repeated requests. In Kerala, the split in the RSP created problems for their contesting the Kollam seat since the dissident faction declared that they would not support the official RSP candidate. In such a situation we had to insist that we would fight the seat in order to prevent the Congress taking advantage of the division. 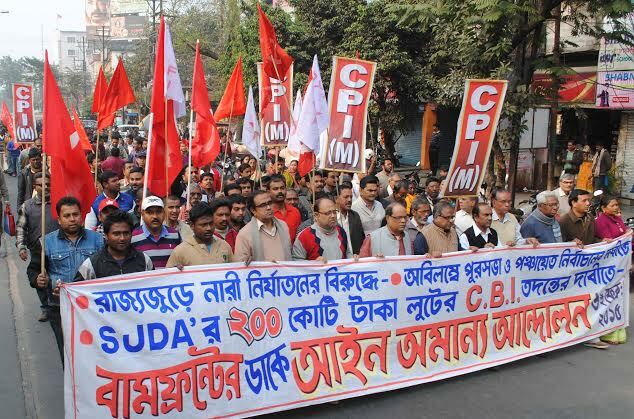 The setback suffered by the CPI is a matter of concern as it can affect the Left base. We should make special efforts to strengthen Left unity and work jointly with the CPI at various levels so that the mass base of the Left as a whole is consolidated to pave the way for enhanced Left activities. An important feature of these elections has been the continuing caste appeal and growing fragmentation based on caste which has been noted in the 1996 and 1998 election reviews too. In some of the states this has got further heightened. In the last few years this caste appeal and fragmentation has not been confined to the Hindi states alone, it has spread to other states too. We have been stressing in the recent period the necessity for the Party to take up the question of caste and social oppression alongwith economic and day to day issues of livelihood of the oppressed sections. While basing ourselves on the class issues which unite all oppressed sections, a general campaign against caste oppression, the disruptive role of caste divisions and an appeal addressed to exploited sections of all castes and communities is essential to be able to make headway. While accepting this generally, Party committees with few exceptions, have not worked out concrete tactics in their respective areas. The voting patters of the minorities shows that in many states the Muslim minorities have given up their earlier antagonism to the Congress after the Babri Masjid event and voted for it where there was no other major secular force to defeat the BJP. However, in some pockets where the regional parties are strong, despite their alliance with the BJP they have remained with the dominant regional party like the TDP in coastal Andhra Pradesh. We have repeatedly noted that in the absence of our Party’s intervention and work among these sections there is no advance of democratic consciousness amongst the minorities with their immediate concern being their security. 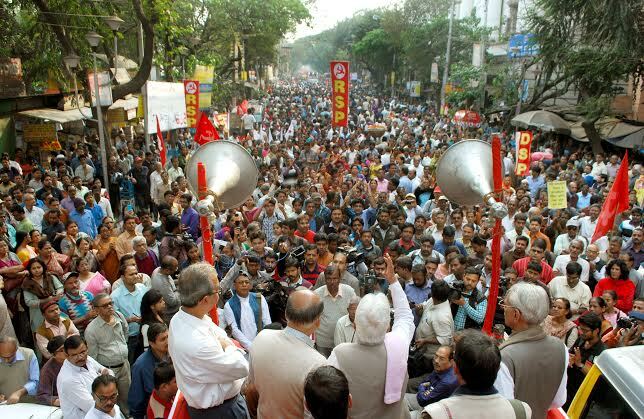 In states like West Bengal where the minorities have been supporting the CPI(M) and the Left Front, we have to see how we can take up their problems of education, employment and social advance so that their democratic consciousness and role in the democratic movement can be heightened. The attacks on the Christian minority has been consciously used by the BJP-RSS combine to consolidate votes on the basis of a Hindutva ideology. The Christians being a very small minority in many areas are easy targets and the vicious campaign is used to arouse and consolidate the Hindu following. It is significant that in the areas where the Christians came under attack like in the Dangs district of Gujarat and in Madhya Pradesh and Orissa, the BJP has been able to achieve electoral success. The return of the BJP-led government with a comfortable majority will mean renewed efforts to undermine the secular-democratic bases of the Indian State and polity. The RSS will penetrate the State apparatus in a more systematic fashion. No arm of the State -- the bureaucracy, the judiciary, or the armed forces -- will be spared. The educational and research institutions will be moulded to serve the Hindutva ideology. The long-term aim of the RSS is to subvert the secular republic and push for a Hindutva-oriented State will come into play. Though the BJP will not put the Hindutva agenda on the government's agenda officially, given the nature of its coalition, the RSS and its various outfits will continue the job of spreading communal ideology and building up of movements. The recent campaign against Christians during the Pope's visit is an illustration. The BJP will covertly use the government machinery to advance its real agenda. The BJP regime will be aided by US imperialism. An authoritarian Hindutva regime committed to open up the economy and the market would be ideal for the US plans for global hegemony. This has serious implications for India's sovereignty and foreign policy. The BJP government's total commitment to privatisation and liberalisation augurs bigger onslaughts on the people. The earlier 13-month Vajpayee regime saw the launching of a nuclear arms race in the subcontinent after the Pokhran tests. The success of the Kargil operation will give a fillip to the forces advocating militarism and chauvinism which will be very detrimental to the interests of the working people. The danger of the BJP reactionary forces being in power at the Centre recognised by the 16th Party Congress, has got heightened as a result of the 1999 Lok Sabha elections. Soon after assuming power, the Prime Minister warned of tough measures to be adopted. Even before the results, a 40 per cent rise in diesel prices was enforced. This had a cascading effect with rise in prices of transportation, bus fares etc. More such attacks on the Public Distribution System, on other essential items for the people are in the offing. The biggest attack on the public sector is underway with the large-scale disinvestment of the public sector shares in the profitable units, proposed closure of eight public sector undertakings and starving the public sector of funds and orders. The fiscal situation of the state governments has reached a crisis point. Some of the states are unable to pay the salaries of their employees on time. It is estimated that 24 state governments have demanded Rs. 15 thousand crores to meet their immediate financial requirements. The agenda of the new BJP-led government includes the opening up of insurance, further privatisation of banks, more concessions to foreign capital in all basic sectors and a more brazen pro-big business policies. The BJP-led government has, without delay, appointed persons with BJP-RSS background in key institutions of higher research and education such as the UGC, the ICSSR and the ICHR. It is going ahead with setting up of a Commission to review the Constitution which is just a device for proposing changes in the secular character of the Constitution and for replacing the parliamentary system with a presidential form of government. Within a month of BJP's coming into power, high level talks have been held with the United State's administration and secret diplomacy through Strobe Talbott-Jaswant Singh talks have been resumed. The advent of the BJP alliance to power with a bigger majority presages more attacks on the Left and democratic forces. The situation in Tripura has worsened in the recent weeks. The extremist groups are launching indiscriminate attacks, resorting to killings and abductions. Such violence has intensified after the previous BJP-led government withdrawn the army and para-military forces deployed there. 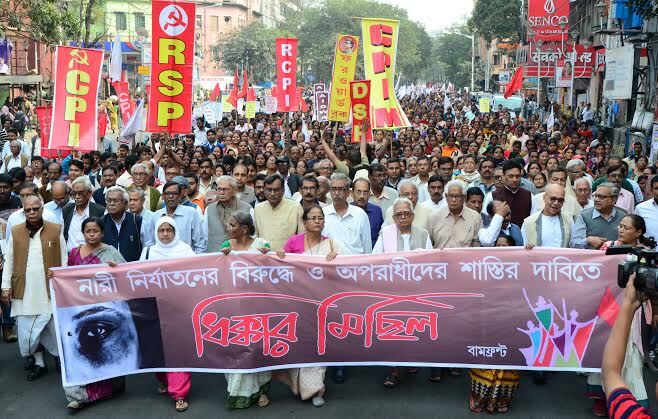 The refusal of the Central government to heed the repeated requests of the state government was politically motivated intended to discredit the Left Front government amongst the people. In Kerala, the BJP has repeatedly collaborated with the UDF to isolate the LDF. In West Bengal too, there will be efforts to forge a united platform under the leadership of Mamata Banerjee to attack the Left Front. It is imperative that the Party be in the forefront to oppose all efforts by the RSS to penetrate the State apparatus. Any attempt to push through the Hindutva agenda on all fronts must be resolutely opposed. The CPI(M) and the Left must be the consistent force to rally all other secular forces in the defence of secularism. We must fight back any anti-democratic moves contemplated by the government. The new government formed by the BJP, will run into difficulties given the nature of the alliance that has been formed. Unlike the BJP, its major partners do not share the Hindutva ideology. They have their own regional identities and aspirations. The disparate and conflicting aims of the alliance partners will bring to the fore contradictions. It will take some time for these developments to unfold. As we develop mass movements on the people's issues, these differences will come to the fore. The economic situation is going to worsen. A number of retrograde policy measures will be brought in Parliament, such as the IRA Bill for adoption. The Party must take the initiative to rally all other forces to oppose such policies. 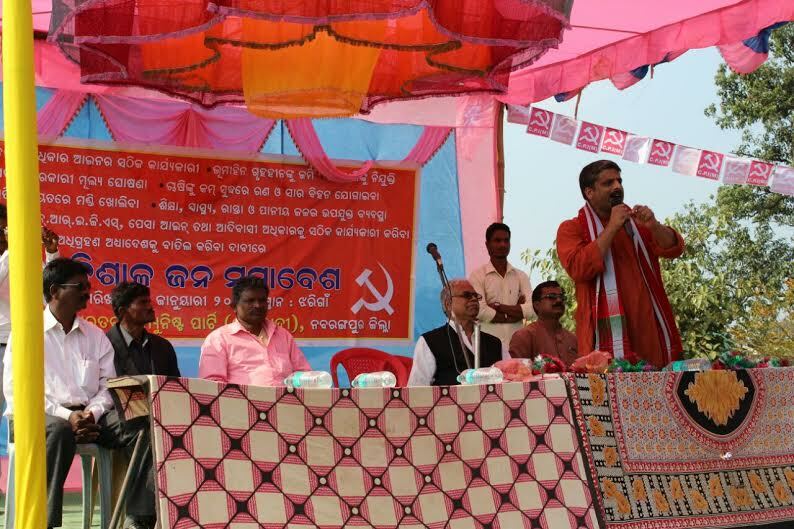 The Party must actively build up movements and united struggles against the economic policies of the BJP-led government and connected harmful measures taken by the state governments. In building up the resistance to these policies, the Party must lend full support to the united struggles of the mass organisations and the trade unions. 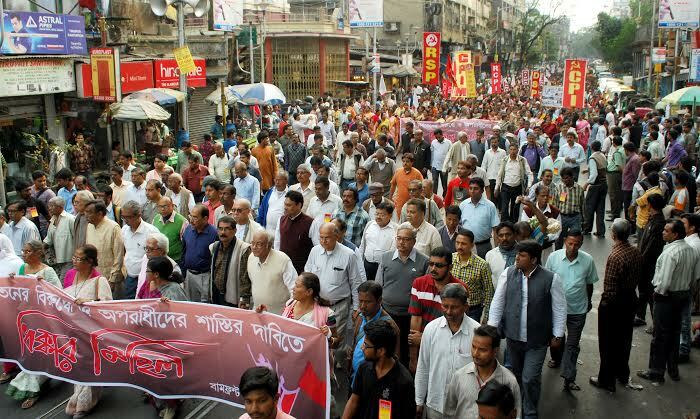 The Party extends its full support to the call of the insurance and banking unions for the movement against privatisation beginning with the march to Parliament on November 29 followed by mass demonstrations in the state capitals. The Party extends its full support to the proposed joint struggles of the public sector trade unions and the sponsoring committee of trade unions. In the month of December, the struggle against the privatisation of insurance and in defence of the public sector should be the focus for a big mobilisation and protest actions. The Party and the Left-led governments should take the lead in championing the rights of the states and for working out a system more in tune with the federal principle. The open alliance of the BJP-led government with the United States and the talk of strategic partnership must be exposed and a powerful anti-imperialist campaign launched. The proposed visit of President Clinton early next year should be the occasion for a widespread campaign against the imperialist pressures mounted on India on the economic and political fronts, and for expressing anti-imperialist solidarity with all those countries of the world which face US aggression. We have to seriously undertake ideological work which must accompany the all-sided activities of the Party. In the existing situation, the Party must make a serious efforts to approach different sections of the people, even those who have been swayed by the BJP's appeal. Patient work is necessary for advancing our political influence. For our own Party we must undertake a programme of Party education by conducting classes. While immediately concentrating on developing the mass movements on the specific issues connected with the harmful policies of the central government and where it concerns the state governments, the Party should also seek to forge links with the non-Congress secular parties who can be drawn into joint struggles and activities. Without expecting the immediate formation of a third force at the national level, we should work towards the reforging of such an alternative.